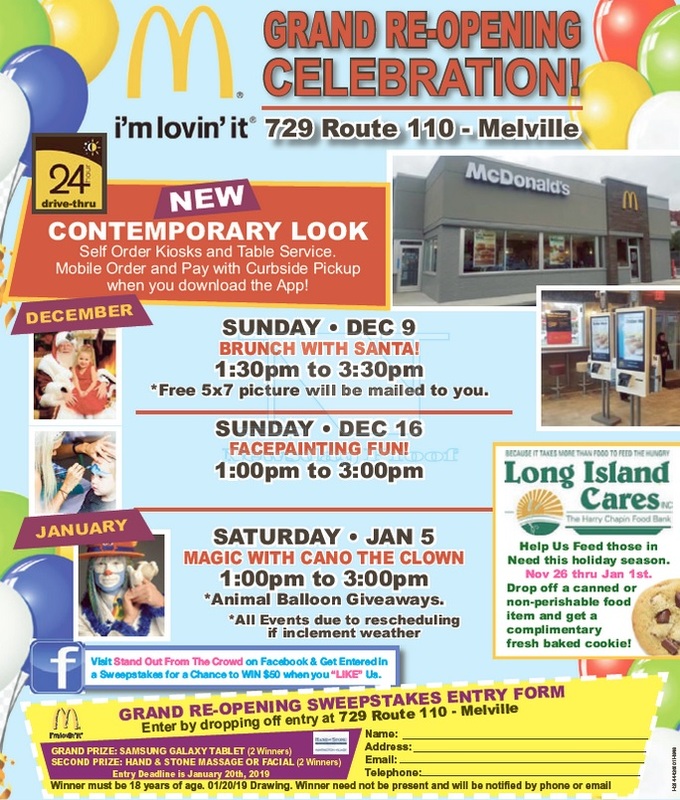 Subject: LongIsland.com - Your Name sent you Event details of "Face Painting Fun - McDonald's Melville Grand Re-Opening Celebration"
McDonald's in Melville is excited to present "Face Painting Fun" as part of its Grand Re-Opening Celebration! The event, held on Sunday, December 16th, will allow kids to express their creativity through fantastic styles and colors! The restaurant's amenities have been upgraded to provide customers with the absolute highest-quality experience. In addition to a contemporary look, there are now self-order kiosks, table service, mobile order and curbside pick-up, and a 24-hour drive-thru. In addition to the Face Painting Fun event, there will be a Brunch with Santa on Sunday, December 9th, and Magic with Cano the Clown on Saturday, January 5th! Also, be sure to stop by between November 26th and January 1st with a canned or non-perishable food item for Long Island Cares and received a complimentary fresh-baked cookie!